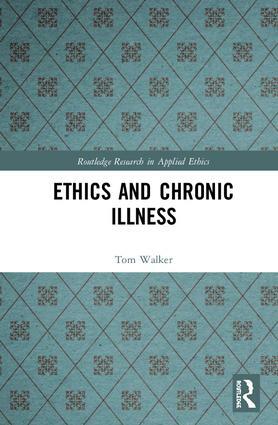 This book provides an account of the ethics of chronic illness. Chronic illness differs from other illnesses in that it is often incurable, patients can live with it for many years, and its day-to-day management is typically carried out by the patient or members of their family. These features problematise key distinctions that underlie much existing work in medical ethics including those between beneficence and autonomy, between treatment and prevention, and between the recipient and provider of treatment. The author carries out a detailed reappraisal of the roles of both autonomy and beneficence across the different stages of treatment for a range of chronic illnesses. A central part of the author’s argument is that in the treatment of chronic illness, the patient and/or the patient’s family should be seen as acting with healthcare professionals to achieve a common aim. This aspect opens up unexplored questions such as what healthcare professionals should do when patients are managing their illness poorly, the ethical implications of patients being responsible for parts of their treatment, and how to navigate sharing information with those directly involved in patient care without violating privacy or breaching confidentiality. The author addresses these challenges by engaging with philosophical work on shared commitments and joint action, responsibility and justice, and privacy and confidentiality. The Ethics of Chronic Illness provides a new, and much needed, critical reappraisal of healthcare professionals’ obligations to their patients. It will be of interests to academics working in bioethics and medical ethics, philosophers interested in the topics of autonomy, responsibility, and consent, and medical practitioners who treat patients with chronic illness. 3. Is an Informed Patient’s Choice Good Evidence that the Option Chosen Is What Is Best for Him?